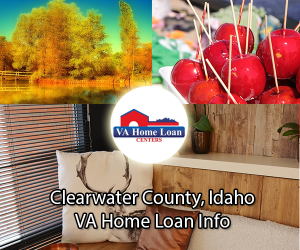 The 2019 $0 down, VA home loan limit for Clearwater County is $484,350. Located in Northern Idaho, Clearwater County provides beautiful views, excellent winter sports options, and some of the friendliest people around. The Idaho State Legislature officially established the county in 1911. The many national protected areas make Clearwater County a great location for outdoor activities like camping, hiking, mountain biking, and much more. The county was named after the majestic Clearwater River. The total population of Clearwater County is 8,562, including a veteran population of 1,041. Offering some of the best skiing in the country, Bald Mountain Ski Area first opened in the early 1960s. The elevation of Bald Mountain is 4,440 ft. giving it excellent opportunities for both expert and novice skiers. The ski area has everything you need for a good skiing trip, including ski rentals and a lift. The Bald Mountain Ski Area lodge is a great place to get warm after a long day on the slopes. Lovers of nature are sure to enjoy the many protected areas in Clearwater County, including the Clearwater National Forest. The forest features 1.8 million acres of lush forest, sparkling rivers, and majestic mountains. If you want some of the best views in all of Idaho, then be sure to visit the Clearwater National Forest. The diversity of interesting wildlife makes the Clearwater National Forest a great place for bird watching. Home to the Dworshak Reservoir, the forest is a great location for avid fishers. The Clearwater River is a beautiful body of water that flows through Clearwater County. The river is the perfect place for a relaxing day outdoors. Providing some of the best fishing opportunities, fishers from all over Idaho visit the Clearwater River. Canoeing and boating are popular activities on the river. There is nothing more relaxing than floating in the Clearwater River in the warm sun. Campers enjoy the many campsites and amenities located along the river. The Idaho National Guard Post is located in Clearwater County. There are several veteran resources located near the county. Veterans living in Idaho are offered many benefits, including education, medical, and employment benefits. The median housing cost is $138,300, and the median household income is $40,134. Call VA Home Loan Centers at 888-573-4496 to complete a VA loan application. Contact VA Home Loan Centers for help finding a VA-approved property in Clearwater County. There do not appear to be any VA-approved condos located in Clearwater County. Obtaining condo approval is easy. Find out how by clicking here.